Lavender Ladies, a photo by Southworth Sailor on Flickr. The lavender season is extremely late this year and although the annual pilgrimage to Sequim was late, it still preceded the height of the bloom. After picking up Marika from the airport and her Florida internship, the Lynden crowd came to Southworth to join Esther for the weekend. I escaped to Lynden and left Calvin to fend for himself amongst the females. 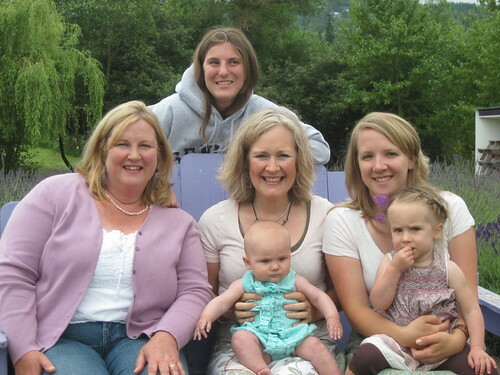 The ladies had a wonderful day in Sequim, taking pictures, picking lavender and strolling the farms. Ada insisted on bare feet and stole the photogenic show. While the ladies were lavendering, Bjorn and I installed their new dishwasher and sailed our dinghies on the light breezes of Wiser Lake. Much to my chagrin, Bjorn's boat sailed circles around my boat. However, mine is more stable and handles the strong winds better.